Ddaeng! Hello, my wig's just flew off an hour ago because I got this package that contains BTS's new album with a special photo card inside the box. I really screamed my lungs off. Yeah, this is a little too late because this album has been released a month ago and mine just arrives now. And I have a new Jin's fansite mini photobook too. Let's take a look! Hello! It's already holiday time! How you guys spend a holiday? Recently, I just discovered myself. I discovered something that made myself like this. I just discovered 'how to make myself eat more deliciously' lololol not important but whatever. It's hard to find a new topic. Can I eat that with you? It's all started with watching all the youtube videos about Kim Seokjin (one of BTS member, in case you don't know) eating some food so deliciously. He has a program named 'EatJin'. The program itself shows him eating the food. I asked myself too why I'm enjoying watching this video as well. Hello! 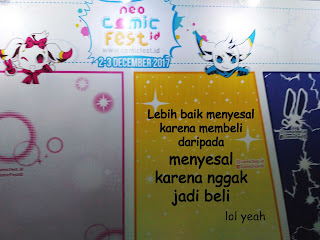 Yesterday, I went to the Comifest 2017 in Neo Soho Mall, Jakarta. So glad that finally got my three days holiday and can go out with my next-door friends! As a villager who never comes to Jakarta before, of course, it feels confused how to get there without spending too much money on transportation. Better buy something cool later. But alhamdulillah, we got there safe and sound. My favorite quotes when it comes to the event like this. Quick edit. That's so trueee. I believed it because yeah, it feels so sad when you missed the things you (should/want) to buy. So, never ever save your money and buy something you like to when you have chances, or not?